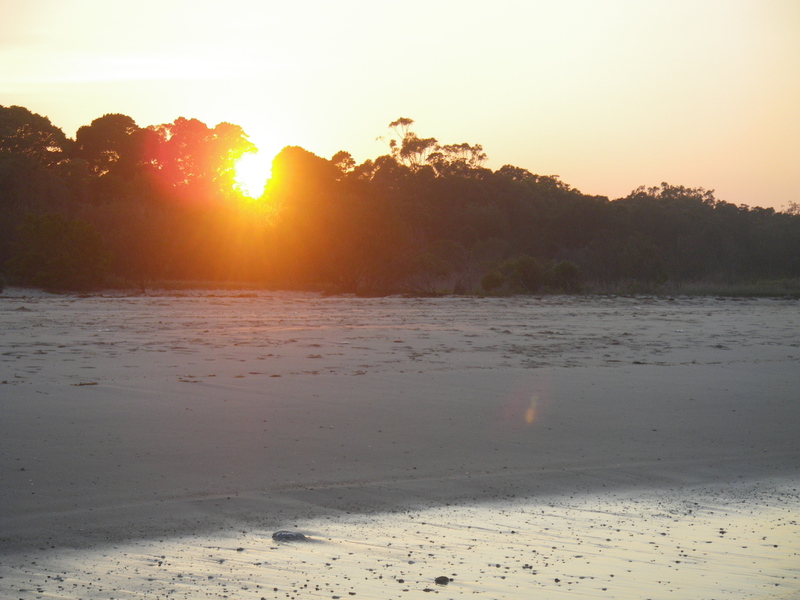 Sunday saw me back at Bongaree on Bribie Island, again. It was another morning low tide at about 7.00 am. I arrived at about 4.45 am and started fishing on the flats in front of Buckley’s Hole. The water was almost completely still and the midges were everywhere. The sun came up behind me and lit up the school of Mullet, that were finning around on the flats. 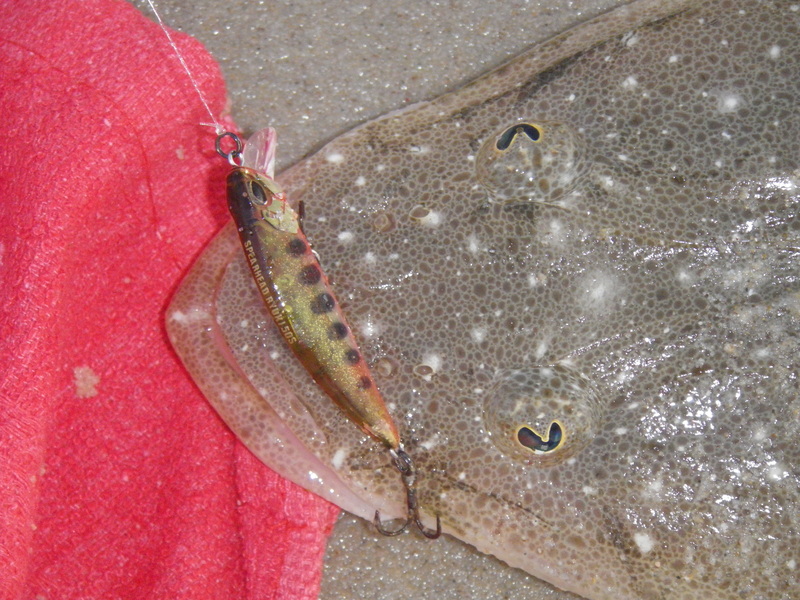 I put on another small DUO hard bodied lure – the Spearhead Ryuki 50s. This is designed as a freshwater trout lure but it will catch just about anything. It is a 50mm long, sinking minnow and weighs 4.5 grams. It has a great wiggling action and is perfect when there is no weed floating around. 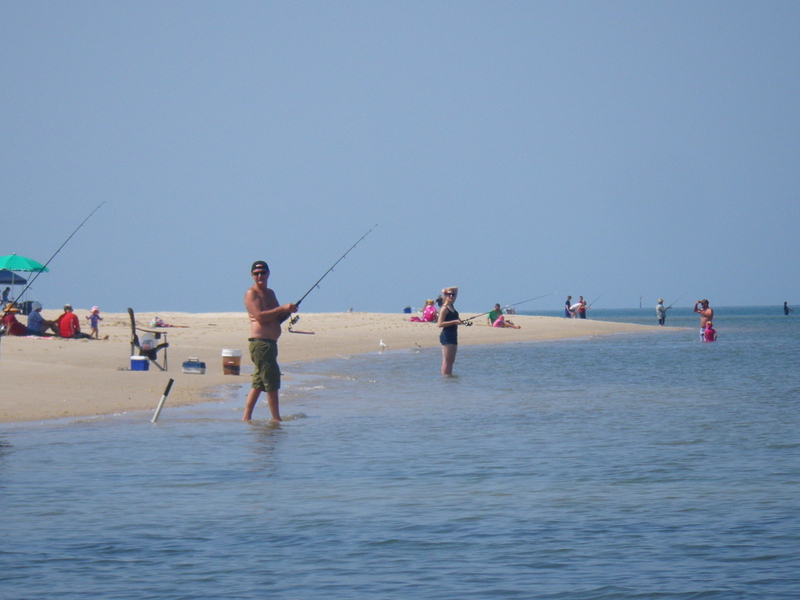 I cast it towards the drop off and hopped it back along the sandy bottom. After about three casts I connected with a fish. The start of the fight is often very lively with the hard bodied lure – I think the trebles are more painful when they first get lodged and the fish reacts accordingly. It settled down and after a few runs, I had it on the beach. It was a 55cm Flathead. It was just before 6.00 am. Kenny arrived and explained that the Jewfish had been breaking the surface to lunge into the Mullet on Saturday morning. The fish were clearly listening because about ten minutes later there was a huge surge about a metre in front of us and loud boof, as a big Jew tried to engulf a Mullet or Pike. It must have missed, as it chased the bait over the ledge and up towards the beach before turning away. Kenny caught some Pike on a bait jig and put one out. We saw the Jewfish repeat its bait attack about 30 metres further north. I decided to wade north and fish around the drain in front of the Seaside Museum. I picked up another small Flathead – just under 40cm. A couple of guys had landed three good ones, a little further north. There were bust ups every 15 minutes or so at various points along the ledge. The bait was everywhere and the bigger fish were making the most it. By 9.00 am there were rods everywhere and boats, kayaks and jet skis humming up and down. I decided to give up for the day. 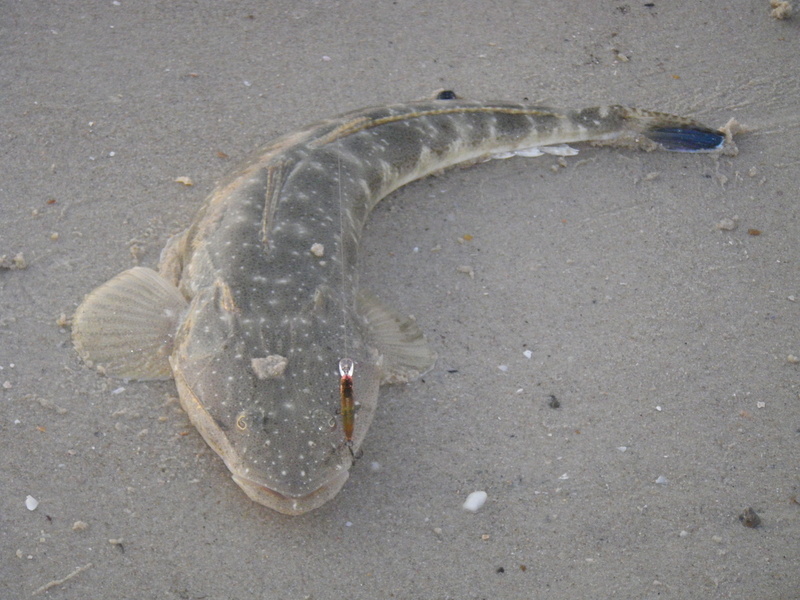 This entry was posted in Bribie Island, Fishing Reports and tagged Bribie Island Jewfish, fishing for Flathead at Bribie, landangler, landanglers fishing reports. Bookmark the permalink. Fishing comp with afew mates at donnybrook on Sunday, any advice in spots for flatties? ?